Standing in line at the grocery store with his mother, a boy was bored and wondering why he had to come along instead of being out having fun on a nice day. At eleven, he would rather have spent his Saturday afternoon anywhere beside the grocery store. While his limited group of friends was out riding their bikes and laughing, he was pushing a cart around the store following his mother. Impatience to get the errands finished darkened his mood because all he wanted to do was to go out to play. In line right behind the mother and son, was a group of teenage girls with their collection of soda bottles and potato chips. Though the boy wasn’t at the “noticing girls” age, he envied their laughter and good spirits. Wishing he could be having fun was one more reason to add to his sour mood as he sighed and moved the cart to the end of the checkout lane. His mother was smiling and chatting with the checkout lady and as always, sharing details he was sure were not important enough to keep him away from his afternoon plans. Then all envy of the laughing girls evaporated as the ringleader in the group chose that moment to expand her commentary loudly enough for people in the adjoining checkout lanes to hear. Moments passed before anyone moved. The only sound was the laughter from the other girls in the group who mumbled their agreement. The boy watched as his mother’s face changed from shades of pink to red. Her eyes, smiling a moment before, glistened with tears. The checkout woman, embarrassed by the actions of the girls, quietly handed his mother the receipt and glared at the group of obnoxious girls in line. Turning towards the boy, the mother pushed the cart towards the door and out into the sunny afternoon that now seemed a little gloomier than just a few moments before. Silence fell on the two as they drove home. The boy watched as his mother fought with her emotions. She was none of the things the girls had called her. She was young compared to the other parents he knew. She had an infectious smile that warmed others and was always there for other people ready to listen and leave them lighter in spirits. She was strong of heart and of spirit. Why would those girls say such mean things to her? Though his mother tried to hide them, her emotions were nearly palpable to the boy. The boy felt his mother’s emotions. He could feel the anger, the hurt, and the shame. The boy felt as if he was experiencing the words directly. He wanted to scream at those girls, cry, and lash out. His emotions were churning within him screaming for an outlet. However, like his mother, the boy sat silently. He knew exactly how his mother felt because he felt the same way every time others threw insults at him. He felt…empathy. Empathy is defined as the action of understanding, being aware of, being sensitive to, and vicariously experiencing the feelings, thoughts, and experience of another of either the past or present without having the feelings, thoughts, and experience fully communicated in an objectively explicit manner. Being empathic might have started before that moment, but from that day on, the boy thought about his words and actions towards others. He paid more attention to the people around him. He began watching for telltale signs of how people reacted to each other, observing emotions that raced across their faces, and the subtle changes in body language. He saw the pain on the faces of the slighted. Many times, he would go to these injured souls and try to say something to offset the offence. Most times as he offered solace, he was met with coldness and anger. The world became a darker place for him with his knowledge of the pain others suffered from the actions of others. The boy grew into an adult, picking up lessons along the way. He became a student of people. He learned lessons about how different people react to insults and varied reactions. Some people lashed out with venomous comments, while others shut down emotionally. He paid attention to what a pleasant word or a gesture would do to change a person’s mood. He also learned that he too, was guilty at times directly or indirectly, for causing others pain. His knowledge of causing others pain was a hard lesson for him to swallow when he remembered that day leaving the store with his mother. 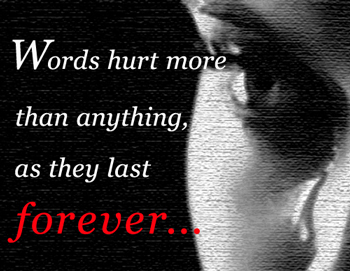 No matter what steps were taken to make amends, once the pain was inflicted no kind words could erase the damage. Thinking back on the ride home that day, he tried to remember if he had said a word to his mother. The memory was cloudy with age, but with a little effort he began to see it again. As they traveled the miles home, his mother drove in silence. Pulling into the driveway, she shut off the engine and reached for the door. Not knowing what to do to make things better, he reached for her arm gently. She turned to look down at his hand and then searched his face in the shadow of the car. At that moment, he understood what to say. Smiling, she patted him on his hand. “Thank you,” she said as she quickly turned away. In the light as he stepped out of the car, he thought he saw a tear glisten her cheek. Do you have a moment in your life that brought about a change of your perspective? Do you think the other girls in line understood or cared about the pain they caused? With all the media attention on bullying, do you think this happens more now than it did decades ago? Does this behavior end with childhood or is it prevalent through all age groups? Thank you for your comment. I hope that it speaks to those that can connect. Thank you for the early morning tears. Beautiful story. As one who was on the bullied end in school, my capacity for empathy grew strong and fast. So many times people say or do things without thinking of the effect it has on others. In this age of social media bullying seems to be more prevalent and it breaks my heart. I recently said something via fb to one of my junior high tormentors. He didn’t realize or remember the hurtful things he said to me back then and was surprised and actually apologetic when I told him how it affected me. I hope the young people today start thinking about what they say and do. I hope they begin to see the toll bullying takes on those being bullied. thank you again for a wonderful blog. (((Hugs))) good for you!! I remember all too well how horrific I had it through school!! Sometimes I wonder if those attackers even remember?? This kinda answers that question.. Goes to show you exactly how much of the bullying was really about you doesn’t it? And kinda makes me wonder what some of my attackers might have been dealing with on the home front…. I had to comment in response to your questions. No I don’t think its worse now than it used to be, probably about the same and if kids today could only realize this is (mostly) a temporary problem! Its gets better amd while it may seem so far away before your school years are done, in reality its over so soon! Sure you’re likely to have other challenges but the ones like these do get easier because you learn to see them for what they are. Focus on learning to love yourself!! Negative garbage like this will always hurt but you do not have to let it take you down! You choose your thoughts don’t even let yourself become entangled with the negative!! So beutifully written and so powerful. I shared this story with my students to help teach them about empathy and it had a huge impact on them. The depth of emotion and the impact of thoughless words was delivered so wonderfully in this article. You captured the very essence of empathy and what an important lesson it is to learn and remember. I am so glad that some of your students were able to use this as a learning experience. It was one of the more emotional articles that I have written. At times, there is a connection when writing and you look up as you type the last few words to discover what you exposed of yourself. Thank you for sharing and keep me posted on the discussions from the students. Damage is damage is damage. In the light of some of my own personal struggles, I have to wonder how many actually realize this to be true? Thank you for your perspective on the article. I must say, “Damage is damage is damage” is something most do not realize. I too have been in all places of the characters in the article. Many times, I look back and wish for some of those moments back. I always look forward to hearing your comments. That is a touching summary to the sentiments of the article. Thank you so much for sharing your thoughts.